Refinishing of hardwood floors is a skill that not many companies have the ability to do. We pride ourselves on being one of the best companies in southeast NC when it comes to sanding and Refnishing your floors. We incorporate dust containment systems in our sanding process to help eliminate the majority of airborne dust particles. One of the beauties of refinishing your hardwood floors is it gives you the choice to pick from a vast array of color selections between traditional hardwood floor stains as well as new modern grey and white-washed looks. We offer many different finish choices to include but not limited to oil based poly, high traffic water based polys, and several hard wax oils that would include Pallman Magic oil and Rubio Monocoat. There are several different sheen levels to choose from including matte, satin, semi gloss and gloss. 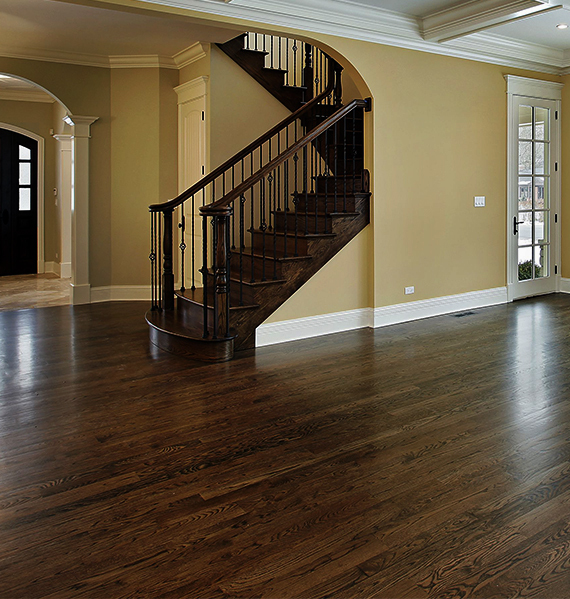 We would love to help you explore the vast array of options of refinishing your hardwood floors. Keep in mind when refinishing your hardwood floors there will be a period of time you will need to be out of these rooms completely as well as a lot of our clients choose to stay elsewhere during this time due to the limited access of your home and the possibility of fumes and dry time. We work with a few local furniture moving companies that assist in the process of removing and replacing furniture before and after the refinish process to help make it as easy and painless as possible for the client. We recommend the use of water-based finishes for most hardwood floor finishing and refinishing jobs, as water-based finishes dry faster and are more durable than oil-based finishes. When water-based finishes are used, the surface can usually be walked on (lightly) in 1-2 hours. Furniture (with floor protection pads and NO sliding) can be moved back in within 12-24 hours. The surface of water-based finishes is approximately 85% cured/dried in 24 hours. Water-based finishes are not drastically affected by humidity and dry more consistently no matter what the temperature or humidity level. Oil-based finishes are drastically affected by humidity and therefore take longer to dry/cure. Oil-based finishes are also not as durable as water-based finishes. We generally only use oil-based floor finishes when we are matching an existing wood floor that is coated in an oil-based finish or when the customer requests it because they want to achieve that ìantiqueî look and the ìamberingî caused by a thick coat of oil-based finish. We proudly use and recommend finishes from Bona.